President Moon Jae-in on Wednesday once again stressed the importance of peace on the peninsula, saying peace will lay the foundations for economic expansion for South Korea. “The peace that we have now is a tentative peace. In the new year, (I) will do my best to make the flow of peace an irreversible wave,” Moon said in his New Year’s speech at the Korea Federation of SMEs in Seoul. Saying that once peace and complete denuclearization are achieved, an era in which “peace tows prosperity can be opened,” Moon went on to highlight his plans for establishing a “community of peace and prosperity” that spans across Asia. Moon was referring to his New Southern Policy and New Northern Policy, which aim to increase South Korea’s economic and political relations with countries to the south and southwest, as well as north of the Korean Peninsula. While Moon did touch on his administration’s push to establish peace with North Korea, the president dedicated much of his New Year’s speech to economic issues, and emphasized the need for a new growth model and for innovation. “We need innovation that creates value, and new industrial policy that overcomes the limitations of our economic structure,” Moon said, saying that South Korea needs to balance exports and domestic consumption. 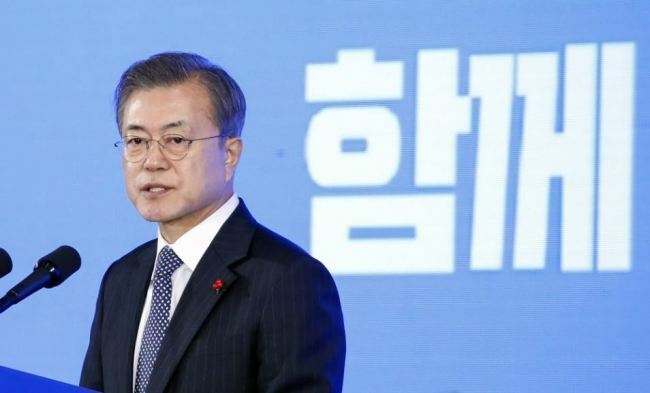 Moon went on to say that in 2018, his government laid down the economic policy direction, and established the systemic frame, and that in 2019 he and the government will try to make the effects of such changes felt by the public. Adding that the country’s research and development exceeded 20 trillion won ($17.9 billion) for the first time, Moon said the funds will be used to create jobs and support industrial innovation. Moon also touched upon regulatory reform, saying he will establish an environment that facilitates investment, and that that the government will strengthen the social security net for workers.